In this activity from Lawrence Hall of Science, you'll use binoculars or a telescope to identify and track sunspots. You’ll need a bright sunny day to complete this activity. Download the printable version of this activity, with associated visuals, here. Be sure to share what you've learned about sunspots with Science Friday's Science Club using the hashtag #ExplainTheSun. Do not look directly at the sun with your eyes, through binoculars, or through a telescope! Do not leave binoculars or a telescope unattended, since the optics can be damaged by too much sun exposure. • Do not use binoculars whose larger, objective lenses are 50 mm or wider in diameter. • Binoculars are usually described by numbers like 7 x 35; the larger number is the diameter in mm of the objective lenses. • Some binoculars cannot be easily attached to a tripod, so you might need to use rubber bands or tape to safely hold the binoculars on the tripod. If you’re using binoculars, cover one of the objective (larger) lenses with either a lens cap or thick piece of folded paper (use tape, attached to the body of the binoculars, to hold the paper in position). If using a telescope, cover the finderscope the same way. This ensures that only a single image of the sun is created. Next, tape one piece of paper to a book to make a stiff writing surface. If using binoculars, trace both of the objective (larger) lenses in the middle of the piece of cardboard. Cut out the circles. Tape the cardboard onto the binoculars to create a shield around the binoculars. This cardboard shield will help block sunlight so it doesn’t obscure the sun’s image coming through the binoculars. Place the binoculars or telescope on a tripod. Without looking at the sun, point the binoculars or telescope toward the sun. Hold the book/white paper about 8 cm behind the eyepiece. You should see a bright circle of light on the white paper. This feature is the disk of the sun! Focus the binoculars or telescope to produce a crisp image. Experiment with moving the paper closer to or farther away from the binoculars or telescope. What happens to the brightness of the image? Sketch the disk of the sun directly on the piece of paper, noting any dark spots. 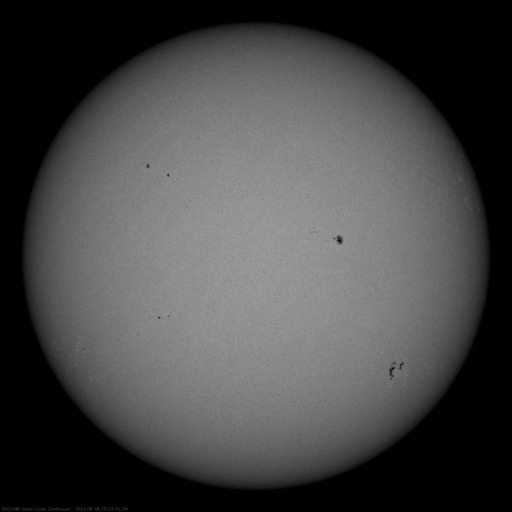 These are sunspots. Remember not to leave binoculars pointed at the sun for too long! If you want to compare your sketch to NASA’s Solar Dynamics Observatory satellite, click here to visit their website. How does this image compare to the sketch you made in the previous step? Sunspots are temporary dark spots that appear on the Sun’s surface. They are caused by intense magnetic activity, and are cooler than the areas of the sun that surround them. Sunspots can be as small as 16 km across (the size of a big city) or as large as 160,000 km across (about 13 times the size of Earth).